Instrument manufacturers are moving to LXI and using LAN for connectivity and control. It is important to have a way of allowing existing GPIB instruments to be part of modern systems without losing performance. The TAMS L488 is a compact adapter that connects directly to a test instrument’s GPIB port and allows it to be controlled over LAN. 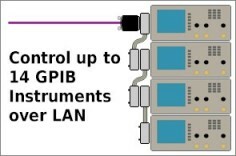 A single Ethernet cable connects the instrument to the local area network and provides power to the adapter, eliminating the need for GPIB cables. This adapter allows users to extend the life of their existing instruments as they move to new connectivity models. The L488 is the easiest and least expensive way to share instruments in a LAN test environment. Twice the speed of other LAN-GPIB gateways for small transactions. TAMS L488 uses the new Power over Ethernet standard IEEE-802.3af. Power is injected into the LAN cable through a PoE network switch or PoE Power Sending Unit. Any power sending device that complies with IEEE-802.3af may be used. When using NI-VISA with the L488, a problem exists with newer versions of VISA. Revs 5.2 through 5.4 cause an error when trying to Add Network Device with the Measurement & Automation Explorer (MAX). This affects all VXI-11 compliant gateways. NI is aware of the issue and working on a solution, but for now downgrading to an earlier version of NI-VISA is the only alternative.